The European Commission wants to obligate internet platforms to monitor all content their users upload for copyright infringements. This is laid out in Article 13 of Günther Oettinger’s copyright overhaul plans. I’ve detailed the harmful effects such upload surveillance would have in my previous post 10 things on the web the EU Commission wants to make illegal: Points 6 to 8 as well as the final one would be consequences to this particular part of the copyright plans. Today I am presenting a study that identifies fundamental legal problems with the proposal, commissioned from Dr. Christina Angelopoulos, an independent expert of intermediary liability at the Centre for Intellectual Property and Information Law (CIPIL) at the University of Cambridge. The study reviews the text of Article 13 and the accompanying recitals from a purely legal standpoint, particularly its compatibility with existing EU law and the Charter of Fundamental Rights. The proposed wording of Article 13 is incompatible with the E-Commerce Directive as well as with the Charter of Fundamental Rights of the EU as interpreted by the CJEU. The study confirms the recent assessment by the European Parliament Research Service (p. 6) that the provision conflicts with the prohibition of general monitoring obligations established by Article 15(1) of the E-Commerce Directive. The provision would also violate the principle of a fair balance between competing fundamental rights as laid out by the Court of Justice of the European Union (CJEU), for example in the SABAM v Netlog and L’Oréal v eBay cases. Recital 38 relies on statements which are unsupported by existing law or previous rulings: The assertion that platforms hosting copyright-protected works contributed by their users by definition perform an act of communication to the public, and the suggestion that any means of optimising the presentation of user-contributed content causes a loss of the protection of the hosting safe harbour, regardless of whether the host had active knowledge and control. Both of those statements constitute a misrepresentation of EU law as interpreted by the CJEU. 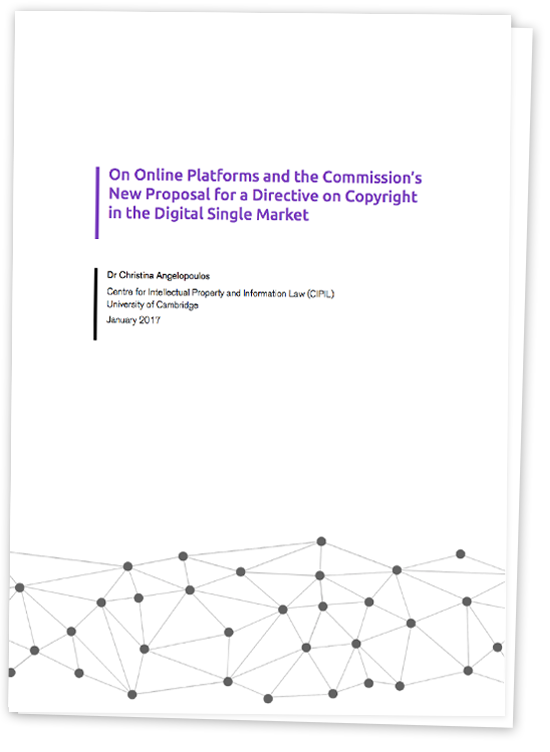 The provision’s ambiguous wording would inhibit legal certainty and thereby create new barriers to the Digital Single Market, rather than promoting it. The study lays out several possible options to fix these issues with amendments. I will carefully consider these options and will discuss them with as many interested parties and colleagues of mine as possible. If you would like to help prevent upload surveillance in Europe, please help by sharing the study, asking your MEP’s office about it, and raising awareness of the issue in your networks. The EU Commission wants online platforms to surveil all your uploads. A new study outlines this plan’s fundamental flaws Tweet this!